Some of the most commonly asked questions on the economy and business are: How do big businesses and companies, small and medium enterprises thrive, reduce unemployment and poverty by creating jobs. In short, how does a country spur economic growth? Every time we try and answer these questions, more questions arise. The latest is how is South Africa going to create and grow black industrialists? The building of African industrialists is something close to my heart. I have spent 25 years of my life in business asking myself how we can build successful and entrepreneurial African industrialists with effective local and international business partners to further strengthen us. I have agonised over this issue because the poverty we see across the continent does not come from lack of resources. Africa is rich with all kinds of potential. What is killing our spirit is poor vision – the eyes to see what we have. And when we do see a little bit better, we do not mobilise the assets we have to take advantage of them. For example, Nigeria has more than 160 million people, just a bit more than Japan. If that is the case then why is Japan the second biggest economy in the world, with virtually no resources? Why is it that Nigeria has oil and minerals but it is far behind in terms of the size of its economy and the standard of living than Japan? I don’t believe economic strength starts with the government, but it can certainly be restrained by government mandates, inefficiencies and incompetence. The government has a role in protecting citizens and ensuring equal opportunity. That is why I have received the news of the government’s black industrialist programme with excitement and a glimmer of hope. Trade and Industry Deputy Minister, Mzwandile Masina announced that the government would create 100 black industrialists in the next three years to participate in the productive sectors of the economy as part of a radical economic transformation programme. We need effective solutions that can also address the rising unemployment youth development issues, and gender inequality on the economic front. I am confident that this will help address our challenges of unemployment and poverty alleviation. Black economic empowerment programmes have been a journey, an enabling bridge that began 20 years ago and will never end, and as the years go by it has to be fine-tuned by the leaders of the time. The black industrialist programme will be one of the contributors and enablers, a catalysts that will have a “multiplier effect”. The government is only a facilitator to build black industrialists. While we may have government policies in place, the reality is that we need to work harder and harder to acquire practical, business and entrepreneurial skills. Practical skills are required. This is the combination of training and experience that enables a potential industrialist to fulfil the core function of his or her business and to understand the processes involved to produce a quality product or service. Whether the business is big or small, good practical skills begin with education or training from a technikon, trade school or university, and are strengthened by on-the-job experience and further training. They are the foundation on which an enterprise’s products or services are built and are essential to its long-term success. Business skills are equally as important to ensure that the company is run on a sound financial basis, and in compliance with legal and regulatory frameworks. While some of these skills can be bought, a good understanding of basic financial and staff management is a must. Many independent enterprises with good products or services flounder because stock control, the debtors’ book and cash-flow management are not as sound as they should be, or because there are problems with labour management. Entrepreneurial skill, a combination of risk-taking, vision, innovation, determination and energy have carried many a small beginner to greater heights. This is what an individual entrepreneur brings to the enterprise, the talent for business that differentiates one from another. What ultimately determines the future growth of a business depends on the entrepreneurial spark that the individual brings to the enterprise. This, when combined with good practical skills and business management ability, is the best recipe for success. The combination of these three skills sets, together with the drive to take the business as far as it can go, will take an enterprise beyond its limits. While we need practical, business and entrepreneurial skills to build African industrialists, they must know that success in business is never automatic. It is not strictly based on luck, although a little never hurts. It depends primarily on the owner’s foresight and organisation. Even then, there are no guarantees. While we need practical, business and entrepreneurial skills to build African industrialists, there are challenges which are out of the control of the potential industrialists. Red tape is still tying down African business, new and old. Petty rules and regulations, incompetence and misplaced “assistance” continue to hinder business expansion and job creation. Small business owners on a regular basis must negotiate a maze of challenges such as market conditions, supplier reliability, competition, competent workers, taxes, government regulations and more. Finding a path toward solutions and strategies to those problems, combined with anticipation of making a profit and being one’s own boss provide the fulfilling nature of African industrialism. The drive to succeed has helped build hundreds of African industrialists. As catalysts for national, provincial and local financial prosperity, African industrialists deserve a lot of attention from government agencies where the bureaucratic boulevard can sometimes be a little bumpy. For example, a Grant Thornton Survey once found that regulation and red tape was cited by 45 percent of business owners in South Africa as the biggest constraint on the growth of their business. The second greatest threat for business owners was the lack of a skilled workforce. Also the elimination of bribery and corruption is one of the most formidable challenges facing the private and public sectors, not only in South Africa, but globally. In the interest of our survival and sustainable business for the future: the more people participated as workers, as producers and as consumers, the more sustainable the economy will be. 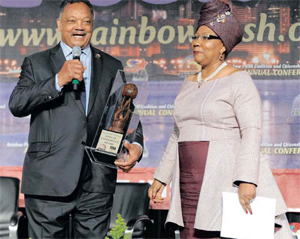 With more and more emerging black industrialists, the future looks bright.